BRCK is a device that brings the internet to remote locations, even without electricity. 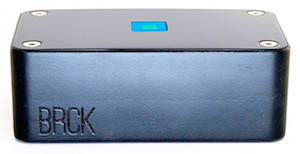 The BRCK’s backup battery and multiple ways of connecting to various networks offers users consistent connectivity even when networks are down and power is sporadic. From coders working in internet cafes in Nairobi to farmers working miles from large conurbations, the BRCK is designed to keep its users connected to the internet under the most difficult circumstances. Each BRCK is connected to the BRCK Cloud, which lets users check on their BRCK from anywhere in the world even if they’re not directly connected to it and, if needed, set up alerts and applications. More importantly, the cloud contains information about the mobile phone networks in each country, so BRCKs can be configured to the latest settings as and when needed. The package is designed so that, even without electricity, users can always connect to the web.